Can these feuding sisters finally put their differences aside? 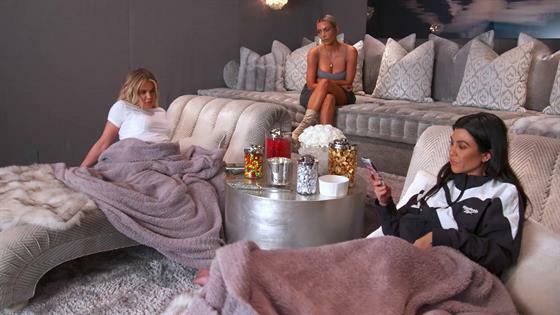 In this clip from Sunday's all-new Keeping Up With the Kardashians, Kim Kardashian and Khloe Kardashianrally together to convince Kourtney Kardashianto join them in a group therapy session where they can talk out their issues. "Well, we're all going to therapy together," Kim tells her sisters. "So, it's happening." "But why?" Kourtney whines. "Because we all need to communicate with a mediator, and we don't have that mediator," Kim responds. While Kourtney isn't against going to therapy, she isn't too into the idea of going to a group session with her sisters. "I don't really think we need to go to therapy to be honest, to solve our problems," Kourtney insists. "I think we should just talk." But it seems talking isn't working out too well for the trio. After a distracted Kourt starts to zone out, Khloe is sure it's Kourtney who needs the most help with her communication. "In therapy are you on your phone or do you give your therapist attention?" an annoyed Khloe asks. "Hmm?" Kourtney mumbles. "If you were listening instead of zooming in on some picture, you would've known what I was saying," Khloe fires back. After more silence from Kourtney, KoKo's had enough. "OK, well I'm not investing myself, so you can f--k off then," Khloe says before storming out of the room. See the tense conversation go down in the clip above!